GD: Welcome Mike to our 4-ever-Toned Fitness Journal. For those who do not know you, please tell us a few things about yourself and how you can help our readers with their fitness and health. MG: Thanks for having me, Geo. Well, to go back a little, I have been heavily involved in fitness and sports for about 17 years now, ever since I was a teenager. Being involved in sports in high school got me interested in strength training and conditioning. At that point, once I started feeling more energetic, getting stronger, and looking better, I was instantly hooked for life. I’m 33 now and still addicted to the way living a healthy and fit lifestyle makes me feel energetic, confident, strong, and youthful on a daily basis. I decided earlier in my 20’s that I wanted to make the commitment to help other people experience the excitement of being fit and getting in the best shape of their lives, especially since we’ve reached an epidemic of obesity, heart disease, diabetes, cancer, depression, etc. That’s why I became a fitness professional. It just gives me so much satisfaction to help others, who have struggled for years to get in good shape, and show them that it can be done, and it can be fun in the process. I’ve expanded over the years from just reaching local individuals with personal training, into being able to help people all over the globe achieve their fitness goals with the reach of the internet. I only hope that my passion for fitness inspires people to take action and improve how they look and feel for life. GD: Now Mike, there’s so many things out there as to what works and what does not work… if you had to pick 3 things that work time and time again to get flat lean abs, what would they be? There’s so much confusion these days about what a healthy diet that promotes fat loss really is… after all, we are bombarded by conflicting messages in the media about what is healthy and what is not, and you have all of these gimmicky diet books about low carb, low fat, high protein, vegetarian, fasting, atkins, south beach, liquid diets, and hundreds more. There’s so much conflicting info, that the average consumer doesn’t even know where to start when it comes to eating for fat loss. For the third thing, let’s talk about actually training the abs specifically. When it comes to training the abs, if you want real results, I always recommend forgetting about the crunches and situps for the most part. They are ok for someone that is really deconditioned, but most people that already have some training under their belt need a much better stimulus for their abs than crunches. Crunches are one of the abs exercises that actually provide the least amount of resistance, and remember that resistance is what develops and tones the muscles. MG: Well Geo, I know this sounds funny to most people, but the MAIN thing that people are doing wrong to get those flat 6-pack abs is… are you ready for this? They spend entirely too much time focusing on training their abs! WAY too much time spent on abs exercises. Sounds crazy, but it’s true. Instead, you must use the majority of your time focusing on training the largest muscle groups of the body like the legs, back, and chest. That’s what stimulates your metabolism and the fat burning hormones that will get you truly lean and sporting a flat sixxer! GD: When it comes to diet Mike, people really have tried millions of ways to get one thing… and that is fat loss. 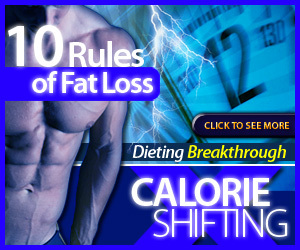 What recommendations have you used to successfully help your clients lose body fat and keep it off? MG: I have included a fully comprehensive discussion of this topic in my book, which accounts for almost half of the book, but I’ll try to make some nice simple generalizations to get people started on the right path immediately. The most important thing is that your diet is as natural and unprocessed as possible. It almost always comes back to the overprocessing of food that makes it unhealthy, and makes it totally wreck your metabolism and hormone balance in your body. For example, why eat refined grains, when you can eat whole grains (even better are sprouted grains, as I usually recommend limiting grain foods overall for best results). Well, I hope you enjoyed this interview and plucked several nuggets of info to get you motivated and started on showing off your flat abs shortly. 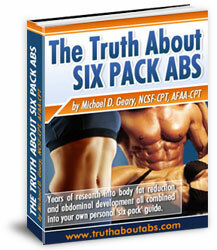 If you don’t already own a copy, be sure to pick up a copy of Truth about Six Pack Abs book and discover the entire system developed for ridding yourself of that extra ab fat for good!